Debt can be a bit like running off a ledge in a cartoon — everything seems normal until you look down. Credit card debt, in particular, can be easy to accumulate without noticing, especially when your debt is spread across multiple credit cards. For consumers with good credit, the best tool for consolidating credit card debt may, surprisingly, be another credit card; a 0% APR balance transfer credit card, to be exact. 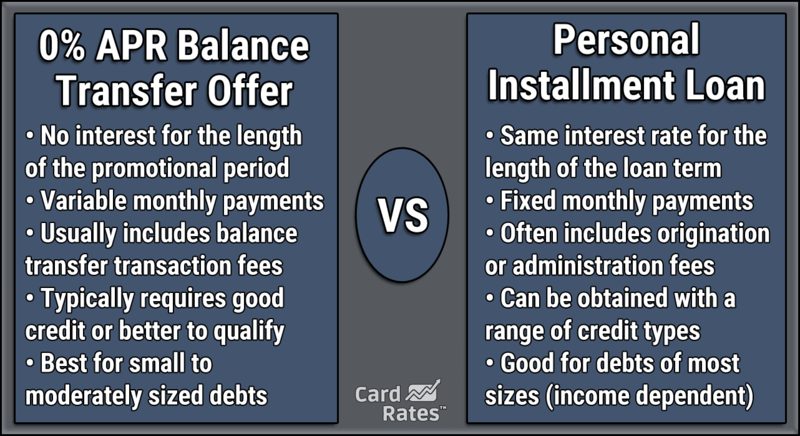 While technically the same as other cards, most so-called balance transfer cards come with introductory APR offers that allow you to carry a transferred balance for more than a year with no interest. The amount of time you’ll get to enjoy 0% interest will vary by card. Additionally, balance transfer cards, as with any credit cards, can come with some costly fees if you’re not vigilant, including both balance transfer fees and annual fees, so be sure to shop around. The card you use for your balance transfer can dictate the success — or failure — of your consolidation. For example, you want a card that not only offers a long introductory period, but the card should also have a reasonable ongoing APR in case you have any of the balance remaining after the promotion expires. You’ll also want a card with low fees. This means a low balance transfer fee (these can range from $0 all the way up to 5% of the transfer amount) as well as a $0 annual fee. And it also helps if the card offers some utility beyond its introductory offer, such as purchase rewards or cellphone protection. 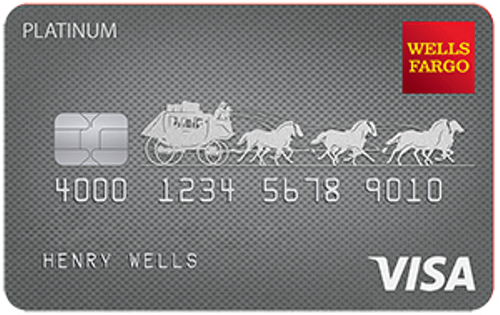 This card ticks all of the balance transfer boxes, offering a long introductory 0% APR deal and a $0 annual fee. It also has long-term value, offering nice purchase rewards for after your transfer is paid off. The card’s only real downside is that it has a balance transfer fee, but that fee is at least on the low end of the range. You’ll get a super long 0% introductory APR period with this card, plus you’ll pay $0 annual fee. It also has a transfer fee on the low end and the potential for a very competitive ongoing APR. Make sure you transfer your balance within the first 120 days to qualify for the promotional rate. Once your transfer is paid off, consider using this card for your mobile phone bill to get cellphone protection. While this card isn’t necessarily one to keep forever, it’s a great choice for anyone who wants to consolidate debt with a balance transfer credit card. Not only does this card provide a long introductory 0% APR period, but it also is one of the few (non-credit-union) cards that offers $0 balance transfer fee. Transfers need to be made within the first 60 days to qualify for the intro rate and fee. Seeing as how the idea behind a balance transfer is to pay down debt, you’ll likely want to have as long as possible to do so. But, don’t feel like you need to select the card with the longest intro period, all else notwithstanding. Do the math on your debt to see how long you’ll really need to pay off your transferred balance. By law, introductory APR offers on credit cards have to extend at least six months, but, after that, there’s a lot of variation in the length of any given promotional period. Most prime credit cards will offer at least 12 months of 0% APR, but you can find cards with introductory offers of 18 months or more. This card was specially designed to be a good balance transfer card, and it pulls it off pretty well. The introductory 0% APR offer provides well over a year of zero interest, and there’s no annual fee to add to your costs. The balance transfer fee isn’t ideal, but it’s also not as high as the fee charged by similar cards. This card has one of the longest 0% APR promotional periods for balance transfers on the market, with almost two years of no interest. The card charges a pretty high balance transfer fee — 5% of the transfer amount — but it has no annual fee. 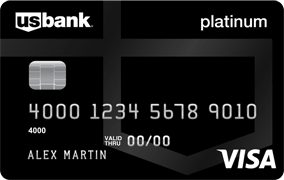 The U.S. Bank Visa® Platinum Card has a long, 18-month introductory APR period and a balance transfer fee that is on the low end of the range. This card also has the potential to offer a low regular APR for eligible cardholders, which can be useful if you need to carry a bit of balance past the end of the promotional period. Plus, pay your mobile phone will with the card to enjoy cellphone protection. With most credit cards, any non-purchase transactions you make will typically come with their own transaction fees — balance transfers included. Balance transfer fees can easily range from 3% up to 8% of the total transferred balance, making them a costly hurdle to a successful transfer. Most fee-free balance transfer cards will come from credit unions, but the major and regional banks also offer a handful of solid cards without balance transfer fees. Keep in mind that most cards without transfer fees will have time limits on when you need to make the transfer to qualify for the waived balance transfer fee. Not only does this card have a $0 annual fee and a 15-month balance transfer 0% APR offer, but it also provides fee-free transfers for the first 60 days. The caveat is that transfers made after the initial 60-day period won’t qualify for the promotional rate or the waived fee. 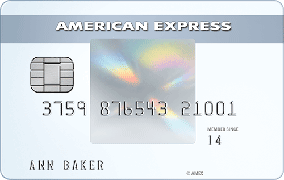 The Amex EveryDay® Credit Card has all the balance transfer features you could want, including a 15-month introductory period and a $0 balance transfer fee on balances transferred within the first 60 days. In addition to its other features, this card also has no annual fee, plus it comes with purchase rewards and a signup points bonus. But, it’s important to remember that you don’t earn rewards on transferred balances, nor do they count toward the signup bonus spending requirement. 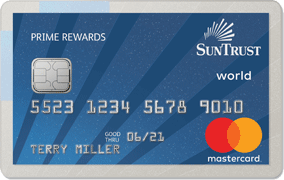 The SunTrust Prime Rewards Credit Card is a bit non-traditional; instead of a 0% APR offer, this card has a three-year Prime Rate offer. Basically, all balance transfers made within the first 60 days will enjoy an APR equal to just the base U.S. Prime Rate for three years. Plus, users pay no balance transfer fee on transfers made within those 60 days. Transfers made outside the initial 60-day period won’t qualify for the reduced rate or transfer fee. Remember that the Prime Rate is a variable rate that may be revised in response to economic changes such as an increase in the federal funds rate set by the Federal Reserve. If you’re looking for a high-rate rewards card with all the bells and whistles, then an annual fee can be well worth the cost. If you’re looking for a balance transfer card to save you money on interest while you pay off debt — well, then, paying annual fees makes very little sense. Happily, it’s remarkably easy to find a card with a good balance transfer interest rate offer that won’t charge you a big fee for the privilege (provided, of course, that you have good credit). These cards have no annual fees and competitive 0% APR deals to help you save while you pay down debt. 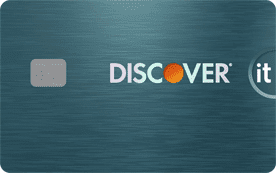 Discover was one of the pioneers of the no-annual-fee rewards card, and, these days, even their balance transfer card has both a $0 annual fee and cash back rewards. Of course, you won’t earn rewards on your transferred balance, but you will enjoy a long 0% APR introductory offer on it. This no-annual-fee card has a solid introductory 0% APR offer that will give you well over a year to pay down your balances. It charges a transfer fee comparable to those of other options on the list, and it provides monthly FICO credit scores. For the long-term use, cardholders who use the card to pay their monthly mobile phone bill can unlock cellphone protection. While this card has a nice intro APR period for balance transfers, it’s also a card you’ll probably want to keep in your wallet long after you’re done paying off your transferred balance, and not just because it has no annual fee. It also has an unlimited 1.5% cash back rate that’s good on every purchase, no matter the category. As easy as it is to accumulate debt as a consumer, it can be exponentially easier for a business — especially when you realize that, despite being digital, your company somehow went through four pallets of paper last year. If you were using high-interest debt to get by, a business card with a good balance transfer offer can make all the difference in getting back in the black. While you likely won’t see the 18-month-plus offers from business cards that consumers get, you can still find a decent 12-month 0% APR offer with a number of solid business cards. 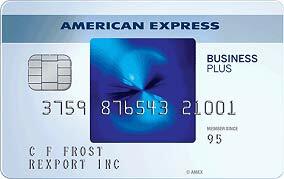 The Blue Business Plus Credit Card from American Express has a lengthy introductory APR offer that’s good for both new purchases and balance transfers. Transfers will be charged a balance transfer fee of $5 or 3% of the total transfer amount, whichever is larger. You’ll need to request your balance transfer within the first 60 days of opening your account for it to qualify for the introductory 0% APR offer. After that, transferred balances will be charged the standard balance transfer APR. 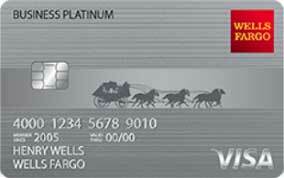 The Wells Fargo Business Platinum Credit Card doesn’t have the longest introductory offer out there, but it does apply to both new purchases and balances transfers. Transfers must be made within the first four months to qualify for the reduced rate. You’ll be asked to choose your rewards type when you first enroll in the rewards program. Those cardholders who choose cash back will earn unlimited 1.5% back on eligible purchases. Cash back is automatically applied to your account as a statement credit. 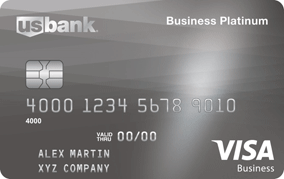 The U.S. Bank Business Edge Platinum Card is a solid choice for growing businesses that want a break from high interest fees. It has a 12-month intro-APR deal for balance transfers and a comparable balance transfer fee. Another plus of this card is that it doesn’t charge an annual fee, so you can keep it open long after your promotional deal is over, without paying for the privilege. Employee cards are also free, as is an easy-to-use suite of spending controls and tracking tools. How Do 0% APR Offers Work? The most magical thing about using an introductory 0% APR offer to consolidate your debt is its ability to reduce your interest fees; indeed, depending on your debt and APR, you could go from paying hundreds of dollars in interest every month — to paying $0 interest. Essentially, intro-APR deals are an issuer’s way of getting you to transfer your debt from a competitor’s card; once your debt is on the new card, that issuer has a foot in the door on not only earning income off of that debt (if you fail to pay it all off before the promotional period expires), as well as future debt you may accumulate on that card. So, how does it work? It all starts with finding the right card. If you have good credit (or better), this is easy; most banks these days offer at least one or two cards with a good intro-APR offer and no annual fee. Keep in mind that you can’t transfer debt between cards from the same issuer — i.e., you can’t transfer debt from one Amex to another Amex — so pick a card from an issuer with whom you aren’t carrying debt. For example, if you need to consolidate debt from a Chase credit card and a Discover card, you’ll need to find a balance transfer card from a third issuer. If you have a low credit score (sub 680 FICO), finding a credit card with a good balance transfer APR offer will be hard. Local credit unions will likely be your best bet, but even that may be a challenge. You may need to spend a few months making on-time payments and paying down your balances to boost your score before you can qualify for a good offer. Once you’ve selected a card with a balance transfer APR offer, you need to apply. In most cases, you can actually include your balance transfer requests during the application process for the new card. Otherwise, you’ll need to wait until you’re approved to request a balance transfer (or transfers). Many major issuers allow consumers to make their balance transfer requests during the application process. After you’re approved for your new card, your balances can be transferred. You can only transfer as much debt as your new card’s credit limit, minus any applicable transfer fees. For example, if your new card has a credit limit of $10,000, you can only transfer up to $10,000, minus the transfer fee. Be sure to continue making any necessary card payments on your other accounts until you are sure your balance transfers have been completed on both ends. And, of course, always make at least the minimum payment by the due date for your new card; late payments not only mean late fees, but they can also cause your introductory APR deal to be terminated. How Do You Avoid Balance Transfer Fees? Balance transfers can be a superb way of reducing interest and making it easier to pay down your debt. But, as with most things in life, credit card balance transfers often have a catch: the balance transfer fee. Typically ranging from 3% to 5% of the total amount transferred, these fees can definitely eat into the savings to be had in a balance transfer. Of course, in an ideal world, you wouldn’t have to pay a balance transfer fee at all. And, happily, that may be an option; a handful of cards from major banks offer waived transfer fees as a part of their introductory APR offers. You can also check out the cards offered by your local credit unions; many credit union credit cards won’t charge transaction fees for balance transfers. That being said, don’t think that just because you’re stuck paying a transfer fee that the transfer isn’t worth doing. Transfer fees can be worthwhile, especially if you’re being charged an APR of 20% or more on your debt and you can get that down to 0%. For example, consider a card with a balance of $10,000 and a 23% APR. If that balance were transferred to a card with a standard 12-month 0% APR period and a 3% balance transfer fee, the cardholder could save around $1,700 in interest carrying the balance for that year, even after paying the fee. Should You Consolidate with a Balance Transfer or a Loan? If you can qualify for 0% APR, it’s probably the best deal. For the longer — and better — answer, we need to look at all the math. In other words, you need to figure out which option will actually be more affordable in the long run. To do this, you’ll want to consider two main things: the fees and the term length. The fees you’ll typically pay to make use of a balance transfer credit card APR offer will be the balance transfer fee for the transaction and the card’s annual fee. If you can find a card that gives you 0% APR, charges no transfer fee, and charges no annual fee, well, that’s probably a slam dunk since you aren’t going to find a personal loan with 0% APR and no fees. However, if you will end up paying a 5% balance transfer fee to enjoy your 0% APR offer, you may have to look a little deeper into the situation, especially if you have good to excellent credit. At the lowest end of the spectrum, personal loans can sometimes be found with APRs as low as 3% to 4% (particularly from credit unions), which may end up being less expensive than a 0% APR offer with a transfer fee. Keep in mind that loans can also come with fees, including administration or origination fees. Make sure you know whether you’ll be charged these fees and that you include them in your calculations. The main caveat to the dominance of balance transfer 0% APR offers is the other factor: the term length. With a few exceptions, most balance transfer introductory APR offers will cap out around 18 months. Whatever balance you have left at the end of that period will start accruing interest at the regular rate (unless you transfer the balance again). If you know ahead of time that you’ll need two years (or longer) to pay off your balance, then a personal loan may end up being the better option. Personal loans can usually be obtained with terms as long as seven years, which can give you plenty of time to pay off a balance without needing to transfer it every few years. For consumers with particularly large debts, a single balance transfer offer may not be enough. That’s because you can only transfer up to the card’s limit, and average credit card limits range from $1,000 up to around $20,000, depending on your credit and income. If you need to consolidate a larger amount than the maximum credit limit on the card, you may need to go with a loan for some or all of your debt. Realizing you’ve accumulated a big pile of high-interest debt can feel a bit like being a cartoon coyote looking down to find nothing but air under your feet — including the sudden shock and “What have I done? !” realization. While simply cutting to the next scene may work for the coyote, finding your way out of debt is a lot more involved. Happily, when combined with an introductory 0% APR offer, a credit card balance transfer can be a good tool for reducing your interest charges and making it easier to pay down your debt. Not all balance transfer cards are created equal, however, so it’s important not only to compare offers, but to the math for your specific situation so you know exactly what you need — and exactly what it’ll cost you in the long run. How to Get a "Black Card"
What Are the Requirements for a Visa Black Card?